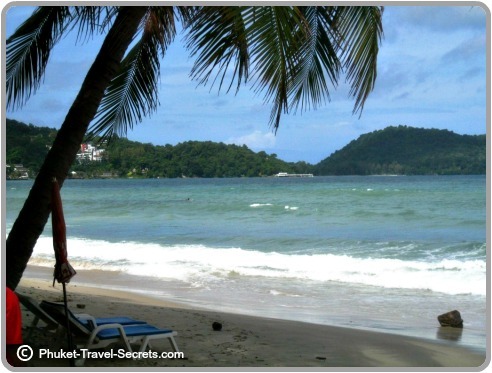 Patong Beach is well developed and remains by far the most popular tourist destination in Phuket, Thailand. 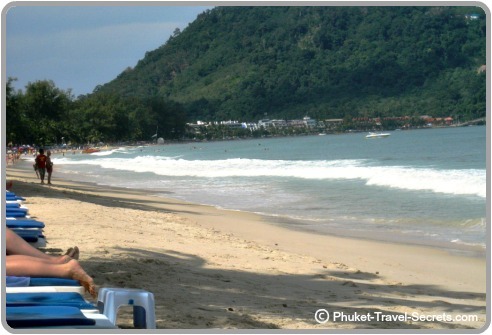 For many visitors to Phuket, especially for the young party goers, Patong is perceived as the ideal holiday destination. A place to go where you can shop till you drop; enjoy a range of fun beach activities and when the sun goes down experience the colourful, exciting and naughty nightlife in Bangla Road. For others, especially for the first time visitor to Phuket, the crowded beach, busy streets and constant buzz can at times be somewhat overwhelming. 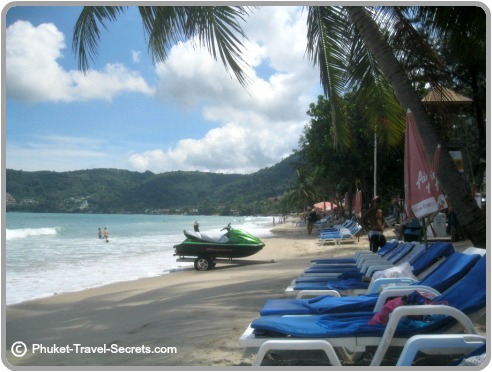 The beach at Patong is alive with sounds, there is a constant buzz of speedboats and jet skis. The busiest section is definitely in the centre, while the quieter areas are towards the northern or southern ends of the beach. Whilst the beach is ok, Patong is by far the busiest beach in Phuket. During the peak months from November through to February it is crazy busy, throughout the rest of the year it sees a constant flow of tourists. 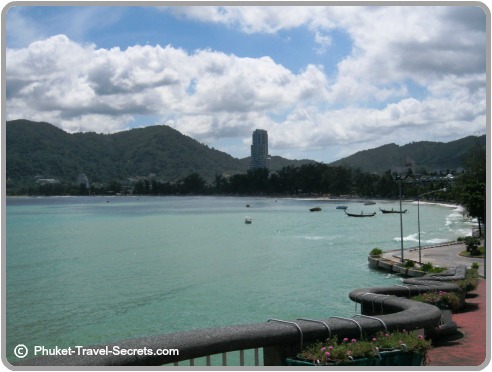 Patong Beach is not for everyone, it’s a tourist destination that you will either love or loathe, but for some return visitors like ourselves it lies somewhere in between. The bonus of staying in Patong is that nearly everything is within walking distance; it has the largest selection of bars, nightlife, shopping, restaurants and a very good selection of hotels and resorts to choose from. Patong offers a great range of accommodation options, there is something here to suit all budgets including cheap guesthouses, budget hotels and luxury resorts. Holiday Inn has long been one of our favorite resorts in Patong. The resort is set in a perfect location close to the beach, and within walking distance to both Bangla Road and Jungceylon Shopping Mall. 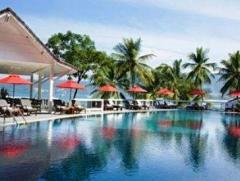 Amari Coral Beach Resort is situated directly on the beachfront at the far southern end of Patong. 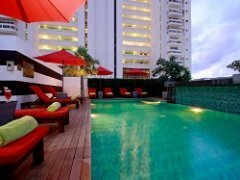 The Kee Resort & Spa is set in a prime location close to Bangla Road and only a short stroll from the beach. 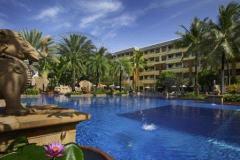 Graceland Resort & Spa is located at the quieter northern end of Patong. The Sea Patong is an affordable priced boutique hotel. BYD Lofts & Serviced Apartments are in a fantastic location only a five minute walk to the beach. 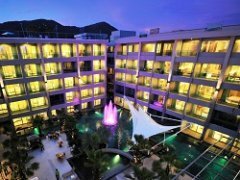 The above are just a few of the hotels and resorts that are available at Patong. Click on "search" in the box below for a more detailed list. Patong Beach is a popular spot for those who are looking for fun beach activities, but I certainly wouldn’t say that it is a relaxing or a secluded beach, far from it. On the upside you will never be bored at Patong as there is a range of water activities, like parasailing, jet skis and banana boat rides to name a few. Towards the southern end of the beach you can hire longtail boats to take you to Tri Tra, Paradise or Freedom Beach. 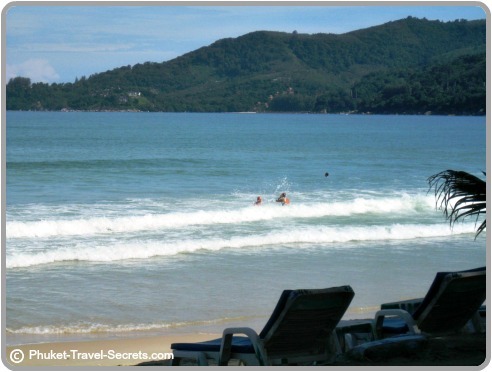 These are quieter, nicer and much more relaxing beaches that are all located in the headland just south of Patong. At the bottom of this page you will find a video clip that we have posted if your keen to go para-sailing. Patong Beach is definitely the main hub for nightlife in Phuket, in particular around Bangla Road also known as Soi Bangla. Bangla Road throughout the day is just like any other road in Patong but once the sun goes down the go-go bars come alive, and the lady boys and pole dancing Thai girls come out to party. There are also other places to go that are more up market, or maybe you would enjoy a drink and like to listen to live bands . Patong Beach has a great selection of restaurants to choose from with a good mix of international cuisines including German, Scandinavian, Austrian, Mexican, French, English, Japanese, Indian, Italian, Thai, seafood and lots of Western style fast food. Along the Beach Road you will find many international restaurants and an abundance of seafood restaurants. For a delicious evening meal make your way to Rat-U-Thit Road where there is a selection of eateries, these restaurants are much cheaper and nicer than some of the more upmarket restaurants. Make sure that you try the corn cobs and kebabs cooked on the carts in the street; they are cheap but taste great. For the kids, you will find three McDonald's restaurants in Patong, one is located in Bangla Road, another on the Beach Road and one in Jungceylon, where you can also get Subway. 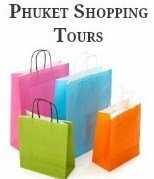 You won’t have to venture to far to go shopping in Patong, there are shops everywhere. In Rat- U-Thit Road opposite Soi Bangla you will find Jungceylon International Shopping and Leisure Complex , the shopping complex houses Robinsons and Carrefour a french based supermarket, as well as over 200 other shops. Patong Beach also has two Ocean Department stores, one is located in Bangla Road and the other is located on the Beach Road near the Holiday Inn. Along the Beach Road at Patong you will find shops and stalls selling bikini’s and beach wear, billabong shorts and shirts, Diesel shirts, dresses, shoes, bags, sunglasses, DVD's as well as souvenirs. The beach vendors walking along the beach sell everything from beer, ice-cream and donuts to clothes and bed linen. If you are after a suit or you would like to get a dress made there are tailor shops everywhere, you won’t even have to go looking they will find you. When shopping at the roadside stalls and shops remember to haggle. For more information and tips about shopping check out our shopping guide. Patong Beach is lively and fun; and if you do choose to base yourself here ensure that you take the time to get out and explore some of the other beautiful areas on the Island. Just to the south of Patong lies Karon, Kata and Kata Noi, these 3 beaches are much more laid back; they can at times be busy but have a more relaxed atmosphere. 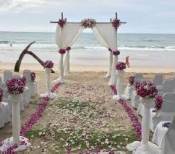 Or head north for a day and explore some of smaller beaches like Banana or Laem Singh. 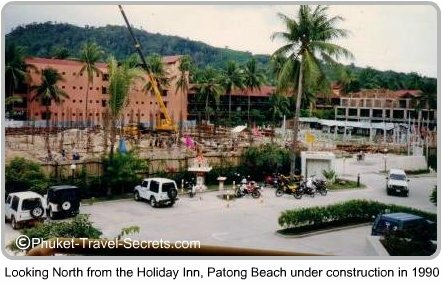 Below is a couple of old photos of Patong Beach that maybe of interest, we took these on our first trip to Phuket back in 1990. Amazing how different Patong was back then. Check out the guy that hangs on for a ride! Patong is located 35kms south of Phuket international Airport; depending on your mode of transport and driver the travel time from the airport will take around 45 minutes. You can read more about transfers from the airport here.